Violent Movies are Evil Not Guns? When she was 12 years old, Jessica Bartholow vividly recalls how she and her 14-year-old sister had to fend for themselves for three days after her mother was arrested and jailed in California for check fraud. “We were so poor that we didn’t have a telephone or food in the house,” Bartholow said, much less money for bail. In the U.S., everyone is presumed innocent until proven guilty. Therefore, everyone is entitled to bail, except those charged with certain serious felonies who, based on the evidence, would pose a safety or flight risk. But people on the lower end of the economic scale, like Bartholow’s mom, are often denied their fundamental right to bail for no other reason than their inability to pay for their freedom. Unless a judge releases them on their own recognizance or on a supervised release, poor people and those with limited financial means who are accused of a crime and cannot post bail, or a portion of their bail, are held in jail until trial or the resolution of their case. Research shows that thousands of poor people and those with low incomes, who have not been convicted of a crime and pose no threat to the public, are forced to remain in jail for weeks, months and even years while waiting to go to trial because they cannot afford bail. Most of these individuals are accused of minor offenses. While in jail, many lose their jobs and housing, and their children are placed into an overburdened foster-care system. Meanwhile, wealthy people, who may pose a greater risk to public safety but can afford bail, are permitted to go home before trial. The law is slated to go into effect on Oct. 1, 2019, but California’s lucrative bail industry, which will be decimated by the law, have formed a coalition to repeal it. The coalition, named Californians Against the Reckless Bail Scheme, consists of bail industry leaders, public safety leaders, criminal justice reformers, crime victims’ advocates and concerned citizens. The coalition had until Nov. 26 to submit the 365,880 signatures it needs from registered voters in California for a referendum. On Nov. 20, the alliance, sponsored by the American Bail Coalition, announced that it has obtained about 577,000 signatures. “The campaign aims to show voters that this new law is unjust and replaces California’s current bail system with a dangerous and untested scheme that would make the state less safe while increasing the numbers of those unfairly incarcerated,” coalition members said in a news release. The signatures still need to be verified by the counties, a process that can take 38 to 68 working days, said Sam Mahood, spokesperson for California’s Secretary of State Alex Padilla. If the projected number of valid signatures is greater than 110 percent of the required number of signatures, Mahood said, the measure would qualify to be placed on the November 2020 ballot. And, the implementation of the bail-reform law would be put on hold until voters get a chance to weigh in. Proponents of the new bail-reform law contend that it will create a more equitable, safer system because all decisions on whether to release people from jail pending trial will be based on their threat to public safety and flight risk rather than their ability to pay a bail. The average bail in California is $50,000, said Katie Hanzlik, press secretary for Sen. Robert Hertzberg, the primary author of SB 10. Some criminal justice reformers also oppose SB 10. Though they favor abolishing the “predatory” money-bail system, they say the new system gives judges too much power, relies on excessive government surveillance of people who are presumed innocent and perpetuates racial disparities. “It is absolutely a positive thing to eliminate wealth-based decision-making in our justice system and to get rid of the commercial bail industry,” said Natasha Minsker, director of the ACLU of California Center for Advocacy & Policy. The ACLU initially supported the bill but withdrew its support. “The final version of the bill did not include sufficient protection against racial bias, and the computer programs that will be used are given a bigger role to determine who gets released than the original version of the bill,” Minsker said. Under the risk-assessment system, Minsker explained that people arrested for misdemeanors will be released within 12 hours without having to pay a money bail and without any risk assessment unless they fall within the statute’s “exclusion list.” This list includes several offenses and other factors that disqualify someone from pretrial release. People arrested for a felony offense will be evaluated by a pretrial assessment officer within 24 hours who will gather data about their personal and criminal history. The data will then be entered into a computer program which will determine whether the accused is a low, medium or high risk to public safety and their risk of flight. Those classified as low-risk must be released within 24 hours unless they fall within the exclusion list. The pretrial services officer or judge will decide whether to release individuals classified as medium risk or hold them until arraignment. People classified as high risk must be detained until arraignment where a judge will decide whether they will remain in jail. Although researchers at the Public Policy Institute of California (PPIC) say racial disparities in arrests have narrowed, “the disparity between African Americans and whites remains substantial.” In its first statewide study of arrest trends between 1980 and 2016, the PPIC found that in 2016 African Americans made up about 6 percent of California’s population but 16 percent of arrests. 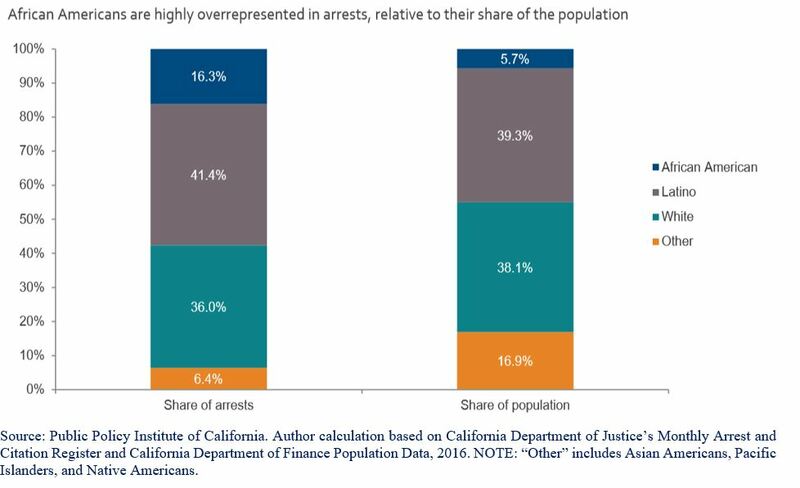 African Americans in California were three times more likely than whites to be arrested in 2016. In contrast, Latinos were 1.1 times more likely than whites to be arrested, said PPIC researchers in a Dec. 3, 2018 report describing their findings. Nationally, people of color are also disproportionately arrested and incarcerated. “Sentencing policies, implicit racial bias, and socioeconomic inequity contribute to racial disparities at every level of the criminal justice system. Today, people of color make up 37% of the U.S. population but 67% of the prison population,” according to The Sentencing Project which tracks developments in the criminal justice system. “Overall, African Americans are more likely than white Americans to be arrested; once arrested, they are more likely to be convicted; and once convicted, they are more likely to face stiff sentences. Black men are six times as likely to be incarcerated as white men and Hispanic men are more than twice as likely to be incarcerated as non-Hispanic white men,” The Sentencing Project said. The ACLU and San Francisco’s Public Defender Jeff Adachi are also concerned that the new law will leave the fate of the accused in the hands of probation officers. “Probation officers, who have a law and order mindset, would be the pretrial officers who would be doing the assessment,” Minsker said. The Judicial Council of California, which oversees the state’s courts, will establish guidelines for the new system and provide a list of computerized assessment programs. A four-member panel, one of whom will have expertise in detecting potential bias in the programs, will recommend how the various risk levels should be defined, Hanzlik said. Each county will decide which program it will use. The risk-assessment system will cost about $200 million annually, Hanzlik added. Despite the ACLU’s concerns, Minsker said the ACLU will work to improve the bail-reform law, rather than overturn it, by fighting for additional safeguards against bias. Even though the law will cause many bail agencies to shut down, Minsker said the bail industry will continue to make money from people detained by the federal government for immigration violations who are required to pay a money bail. Under California’s current bail system, bail amounts are established by a fixed “bail schedule” which matches each charge to a dollar value. The bail schedule is prepared annually by judges who have the discretion to adjust bail amounts. Every county has its own schedule, so someone charged with a felony assault with a firearm, for example, would have to pay a $50,000 bail in Los Angeles County and $125,000 in San Francisco County, said researchers at the UCLA Luskin School of Public Affairs. If the accused appears at all court dates, the court refunds the bail payment regardless of the outcome of the case. If the accused fails to appear in court, the bail is forfeited. Bail agents typically charge 10 percent of a bail and assume responsibility for the full bail if the accused fails to appear in court, but agents rarely pay the full bail. An analysis of California’s bail system by a judicial workgroup revealed that the state’s forfeiture laws make the process of initiating and collecting forfeited bails from bail agencies too complex, labor-intensive and costly for the courts to pursue, so they are often relieved of paying, in some instances, millions of dollars. Some bail agencies offer payment plans at high-interest rates. Many also require property as collateral which may be seized if the accused fails to appear in court. Unlike the courts, bail agencies do not refund any money. Consequently, people can incur substantial debt even if their case is dismissed or they are proven innocent. On Jan. 16, 2019, California’s Secretary of State Alex Padilla announced that the state’s new landmark law to abolish the money-bail system, which was slated to go into effect on Oct. 1, has been put on hold. A well-funded campaign, sponsored by the bail industry, to overturn the law has obtained the signatures it needed to put the measure on the Nov. 3, 2020 general election ballot. This is a major setback for some criminal justice reformers who were anxious to eliminate money as a determining factor on whether to release people, who have been accused of a crime but not convicted, from jail prior to trial. It is now up to voters to decide the fate of bail reform in California. Padilla said in order to qualify for the ballot the referendum needed 365,880 valid petition signatures. Based on a random sampling of signatures, election officials projected the referendum had over 400,000 valid signatures. When I was a child, growing up in a small island in the Caribbean, I used to watch the news magazine program 60 Minutes religiously with my beloved father and dream about being a roving reporter who would meet people from all walks of life and tell interesting stories. I lived vicariously through the journalists who traveled the world, sometimes risking their lives to tell the stories of people who were oppressed or suffering from famine, diseases or war. I was enamored by the power of the media to give a voice to individuals who were disenfranchised or marginalized and their ability to provoke positive changes in society by exposing injustice and abuse. Journalists not only keep us informed, they help us stay connected to each other and remind us of our shared humanity. This is why I became a journalist. Journalism can often be a thankless profession. Most reporters work long hours under stressful conditions for inadequate compensation. Sadly, starting salaries for reporters have not changed much over the past 30 years, as some local newspapers still pay entry-level reporters between $20,000 to $30,000. And, the competition for high-paying jobs for experienced journalists is fierce especially for minorities, forcing good journalists to leave the business. Many journalists, like myself, were drawn to journalism out of their desire to make a difference in society. Journalism is not just a job, it is a public service. It is not just what journalists do, it is part of who we are. The majority of journalists that I have worked with are fair-minded and vigilant in their pursuit for the truth. An essential part of a journalist’s job is to hold elected officials accountable, because this is fundamental to our democracy. Democracy is contingent upon a free press providing uncensored information to the public, so citizens can make informed decisions about their lives and government. Democracy also depends on the public’s trust in the press. For more than two years, President Donald Trump has verbally attacked well-respected news organizations and journalists, calling them “fake news” and even referring to them as “the enemy of the American people” in his effort to divert attention away from his reckless statements, the Russia investigation and some of his ill-conceived policies. Trump’s incendiary comments have incited distrust of the media. Although Trump has no one to blame for negative news coverage but himself, cable news programs that cover and analyze the Trump administration at nauseum while ignoring or underreporting other major stories only give credence to Trump’s claim that the media are treating him unfairly. Political analysts warn that distrust of the media can lead to incivility, chaos, an erosion of democracy and ultimately violence. All Americans should be concerned about this, especially in light of the June 28, 2018 shooting at the Capital Gazette in Annapolis, Maryland where a lone gunman, who authorities said had a longstanding grudge against the community newspaper, shot his way through the newspaper’s glass door and killed four journalists and a sales assistant. Two others were injured in the attack. In the aftermath of the shooting, Trump said, “Journalists, like all Americans, should be free from the fear of being violently attacked while doing their jobs.” Given the fact that Trump has created a toxic environment for the media that has put journalists covering his rallies and other events in harm’s way, his words sounded like nothing more than mere platitudes that were written by one of his aids. In the midst of their grief, the reporters at the Capital Gazette and their parent company, The Baltimore Sun, continued to do their jobs. They covered the slaying of their colleagues by a man who by all accounts was deeply disturbed and had no business owning a firearm. This is what journalists do. They report the news even in the most difficult of circumstances, because democracy only prevails if the media refuses to be silenced or forced into submission out of fear. While this horrific incident was not linked to Trump, it should serve as a wake-up call to him and his cohorts that their rabble-rousing words have serious consequences. One cannot keep fanning the flame of hostility and bigotry against certain groups of people then act blameless when chaos erupts. Trump governs as if he is playing a high-stakes poker game, but real lives are at stake here. He needs to cease his scurrilous attacks on the media and others before more people get hurt. The victims of the Capital Gazette who lost their lives while doing their jobs and the survivors who watched them die deserve more than empty platitudes and prayers from their leaders that are not accompanied by meaningful action. They deserve respect, stricter gun-control laws and the protection of their government who is supposed to protect all Americans not put a target on their back by labeling them as the “enemy” just to score political points. The Bible says in James 2:20 that “faith without works is dead.” American journalists are patriotic people committed to serving their community, being the watchdog of those in power and giving a voice to the downtrodden. They are not the enemy. They are true friends to all those who value our democratic way of life. In America, we live in a new age where people are called out, as they should be, for using derogatory terms to refer to certain ethnic groups and gay people, but this new wave of consciousness does not seem to extend to people grappling with mental illness. In the aftermath of the horrific shooting at Marjory Stoneman Douglas High School in Parkland, Florida on Feb. 14, which claimed the lives of 14 children and three adults, several politicians and ardent gun-rights supporters have repeatedly used derogatory terms to refer to people with mental illness. Yet, there has not been the same level of outrage that often follows when defamatory rhetoric is used to describe a whole class of people. “I don’t believe that this insane monster should have ever been able to obtain a firearm. This individual was nuts,” Loesch said, adding that there is no federal requirement for states to report “crazy people” and convicted murderers. Loesch failed to mention that the NRA opposes universal background checks. The NRA has also fought the banning of semiautomatic weapons for years, and it is opposed to raising the age limit to buy a firearm from 18 to 21. Nikolas Cruz, the 19-year-old confessed murderer, used an AR-15 semiautomatic rifle, which he purchased legally, to mercilessly kill 17 people at Marjory Stoneman Douglas High School and injure 14 others in the space of six minutes, law enforcement officials said. Although Florida does require background checks for gun sales, Cruz passed the check, because he did not have a criminal record, and there was no legal finding that he was mentally incompetent even though he has a history of emotional, behavioral and mental problems that include severe depression, Attention Deficit Hyperactivity Disorder, Obsessive-Compulsive Disorder and autism. Police records reveal that there were numerous complaints about Cruz’s disruptive behavior and that the FBI even received a tip in January from someone who said that Cruz was a possible school shooter. However, Cruz, who was expelled from the school, was never charged with a crime. The FBI has since apologized for mishandling the tip. Sen. Marco Rubio (R-Fla.), who also attended the meeting, said that he does not believe banning semiautomatic guns will help solve the problem of gun violence. Rubio was booed after he refused a student’s request to not accept any more donations from the NRA. The NRA has contributed a huge amount of money to political campaigns and spent millions to help elect people who support its agenda including President Donald Trump and Rubio, according to the Center for Responsive Politics. Rubio did, however, break with the NRA when he told students that he would support raising the minimum age to buy firearms to 21. Rather than recoiling into the background after their friends and classmates were slaughtered, the remarkable children of Stoneman Douglas quickly mobilized and began the #NeverAgain movement to advocate for better gun laws and a ban on semiautomatic firearms. They took their concerns directly to the doorsteps of Florida’s capital and the White House, demanding to be heard. Scott, Rubio and Trump say they are also now in favor of banning bump stocks, a device that allows semiautomatic guns to fire at a faster rate. Democratic Sen. Dianne Feinstein of California led an unsuccessful effort to ban bump stocks after the Sandy Hook Elementary School shooting in 2012. Calls to ban the device and semiautomatic weapons intensified after the Las Vegas massacre in October 2017, the deadliest mass shooting in modern U.S. history, but no action was taken. Scott’s plan, if passed by the state’s legislature, will close loopholes in the law that allow people with mental problems to buy guns; provide $50 million for mental health services; penalize people who make harmful threats against schools on social media; and provide $450 million to improve school security. This includes installing metal detectors, bullet-proof glass, steel doors and upgraded locks. The governor also wants to make it mandatory for every public school in Florida to have at least one law enforcement officer for every 1,000 students and provide armed training for school personnel upon a school board’s request. While expanding mental health services and improving access to treatment are important measures, Scott’s plan falls short because it does not include banning semiautomatic firearms which have been used in other mass shootings on U.S. soil. Scott, Rubio and the NRA refuse to address the root causes of gun violence in America, and that is, the proliferation of guns, easy access to guns and the sale of weapons and ammunition that were designed for warfare not sport Consequently, civilians are using guns to hunt other civilians. Some law enforcement officers, who are often outgunned by criminals, also support banning semiautomatic weapons. Instead of engaging in a thoughtful discussion about gun control, the NRA’s CEO Wayne LaPierre has reverted to the same old talking points and is accusing the Democrats and gun-control advocates of exploiting the Florida shooting and trying to rob American citizens of their Second Amendment rights and civil liberties. LaPierre’s accusations are unfounded, because the grieve-stricken children who survived the Stoneman Douglas massacre are the ones who are leading the charge for stricter gun-control laws this time, and their only agenda is to create safer schools and save lives, so LaPierre and his cohorts are the ones who are shamelessly exploiting this tragedy with their poisonous rhetoric. LaPierre’s failure to acknowledge the harm that guns, particularly military-style assault weapons, have had on this generation of students for whom shooting drills in schools are the norm is a slap in the face to these children and others who have suffered from gun violence. LaPierre has tried to discredit everyone and every institution that does not acquiesce to the NRA’s way of thinking. The NRA has constantly espoused the value of guns while using the heinous acts of a few to disparage all people with mental illness and blame them for the country’s high rate of gun violence. However, mental health experts say most people with mental illness are not violent, and most firearm crimes in America are not committed by the mentally ill. The American Psychiatric Association and the American Psychological Association have both expressed concern about how officials are unfairly framing the discussion about gun violence around people who suffer from mental illness. “Recent disparaging and inaccurate remarks about mental illness serve only to perpetuate stigma and prohibit honest and open dialogue about an illness (or disorder) that affects one in five people in the nation,” said the American Psychiatric Association in a statement Friday. “It is important to remember that only a very small percentage of violent acts are committed by people who are diagnosed with, or in treatment for, mental illness,” said the American Psychological Association in a separate statement. Statistics show that countries like the United Kingdom, Australia and Japan that have fewer guns and stricter gun-control laws, have less firearm-related deaths than America, even though they have citizens with mental illness. “With less than 5 percent of the world’s population, the United States is home to roughly 35–50 percent of the world’s civilian-owned guns,” according to a report by Switzerland’s Small Arms Survey. The Council on Foreign Relations reported that the United States also has the highest homicide-by-firearm rate of all developed nations. “Gun violence is a public health epidemic that is growing in frequency and lethality, and it is taking a toll on our patients,” the American Psychiatric Association members said. People suffering from mental conditions should be treated with the same compassion as those suffering from a physical illness. The NRA’s rhetoric may discourage people with an emotional or mental condition, like Cruz, from seeking treatment for fear of being stigmatized or ostracized. Experts say most people with mental illness live normal, productive lives with proper treatment and support. If our elected officials are serious about alleviating America’s epidemic of gun violence, they need to implement stricter gun-control laws, ban assault weapons, and develop a holistic, well-thought-out plan that addresses the impact of gun violence on communities in the United States and the social determinants that contribute to gun violence such as gangs and illegal drug activity. Mental illness is a small fraction of the problem. People with mental illness and children deserve leaders who will fight just as passionately for them as they will for the right to buy military-style weapons despite the human cost. Surely, lawmakers can find a way to balance American’s constitutional right to bear arms with sensible legislation that protects human life, especially the most vulnerable among us. Maybe the children of Marjory Stoneman Douglas High School will finally be the catalyst to breaking the stronghold that the NRA has on America’s political system by shaming politicians into reforming the country’s gun laws and stopping the carnage in our schools, churches, movie theaters, nightclubs, concerts and streets without turning America into a militarized nation. Almost five months after surviving two back-to-back Category 5 hurricanes, thousands of residents in the U.S. Virgin Islands are still living in limbo, because they have not received money from their insurance company to rebuild their homes and businesses. This puts residents in a precarious position, as the 2018 hurricane season begins on June 1. The total projected losses for Hurricane Irma, which ravaged the islands on Sept. 6, 2017, are $787 million, said Gwendolyn Hall Brady, the director of the Division of Banking, Insurance and Financial Regulation. “Hurricane Maria’s projected loss [is] $445 million,” Brady said. Maria struck the territory 12 days after Irma, causing more catastrophic damages. The U.S. Virgin Islands has an estimated population of 104,000 and is made up of four main islands – St. Thomas, St. John, St. Croix and Water Island. Many residents do not have insurance. The most recent data on insurance settlements reveal that only about 30 percent of all insurance claims have been settled. In a recent news conference to update the community on hurricane insurance claims and related issues, the U.S. territory’s Lt. Gov. Osbert Potter reported that, as of Jan. 10, a total of 14,881 insurance claims were filed. Of that number, 4,346 claims have been closed with payment, and insurance companies have paid out $435.6 million to victims of Hurricane Irma and $82.8 million to victims of Hurricane Maria. Potter, who also serves as the commissioner of insurance, said the Division of Banking, Insurance and Financial Regulation, has received over 1,000 complaints from residents about issues with insurance companies, banks and contractors. The division is responsible for regulating the insurance industry and protecting consumers’ interest. Residents have complained about adjusters who fail to get back to them in a timely manner after completing a damage assessment of their property; the slow pace of insurance settlements; and about being blindsided by insurers who informed them that they did not have adequate insurance to cover their losses. Potter said he knows residents are frustrated, but they should not feel like “there is no hope and no help.” Though his office is short staffed, he said his team is committed to helping residents resolve their issues, and he has issued several orders intended to improve the insurance claim process and protect consumers. “There is not one, who can say truthfully, that they came to our office and were not assisted,” Brady said. Residents had to wait for weeks or over a month for an adjuster to inspect their property. And, some say, after the inspection, they had to wait another one to two months just to hear back from the insurance company, only to be told that their property needed to be reassessed by a new adjuster. “Immediately after the hurricanes, there was no transportation into the territory, the airports were closed, and a lot of adjusters could not get here for 15, 30 days after the disaster,” Potter said in an interview following the news conference. However, he said it pains him to hear that consumers have waited so long to hear back from their insurer. To remedy this situation, Potter issued an order requiring insurance companies to respond to customers within 30 days after an adjuster inspects their property. Insurers can get a 15-day extension for good cause. Potter urged residents to report insurers who violate this order. “We can fine companies monetarily and go as far as revoking licenses if we deem necessary,” he said. Despite the destruction caused by the hurricanes and the territory’s well-known financial woes, Gov. Kenneth Mapp contended in his State of the Territory address in January that the future of the Virgin Islands is bright due to: the influx of federal money, which will allow the territory to modernize its facilities and make them more resilient; the creation of construction-related jobs; and planned upgrades to the islands’ antiquated electrical grid, which relies on costly imported fuel. Daily life for most Virgin Islanders is difficult. Many residents are still living in damaged homes with blue tarps for roofs or are displaced and living with family and friends. Power was restored to almost 100 percent of customers on the electric grid in January, but many street lights and traffic lights are still down, and there are frequent power outages as repairs continue. Residents are also saddled with high electric bills. The average price of electricity is about three times more than the average in the 50 states, according to a September 2017 report by the U.S. Energy Information Administration. The cost of groceries, which was high before the storms, has skyrocketed due to price gouging, and the roads are in dismal condition. Officials say many government workers have not had a pay increase in years. Some private-sector employees have been laid off without a pension after years of service, a scenario that occurred after previous hurricanes, and public-sector employees are worried about their pensions due to over $4 billion in unfunded retirement liabilities. Crime has increased, and if residents get seriously ill, they risk being evacuated off-island, because the territory’s two hospitals were severely damaged and can only provide limited medical care. To date, the promised temporary modular units for the hospitals and damaged schools have not been erected. The delay in insurance payouts coupled with a housing shortage and the looming 2018 hurricane season has added to residents’ anxiety. The U.S. Department of Housing and Urban Development (HUD) announced Friday that it has awarded a $242.7 million grant to the Virgin Islands to bridge the housing gap. This is a welcome relief for displaced and uninsured residents. Kelvin Jones, a retirement consultant in Chicago, said he has been trying to help his elderly mother, who lives on St. Thomas, with her insurance settlement, but keeps getting the run around by her insurer, Real Legacy Assurance Company. The company provides insurance to AARP members in the U.S. Virgin Islands and Puerto Rico. “My mom’s house was damaged, and the roof was breached by Hurricane Irma, but she is still living in the house. She filed a claim with Real Legacy in September, and her home was inspected in November by GAD Adjusters, who was retained by Real Legacy,” Jones said. “When I followed up with the GAD adjuster two weeks ago, the GAD adjuster told me all of their claims were being reassigned to another claims adjuster company, so they sent all their files to the insurance company. But, a representative from Real Legacy in St. Thomas indicated that GAD Adjusters did not provide Real Legacy with the appropriate records, so it needs to send a new adjuster to re-inspect my mom’s house,” Jones said. “The representative also told me that Real Legacy is no longer doing business with GAD adjusters in the Virgin Islands, but it is still doing business with Puerto Rico. “It’s not just homeowners that are affected. A lot of businesses are waiting on their insurance money to repair their businesses, and it’s holding up progress,” said Andre Malone, a St. Thomas resident. The angst among residents waiting for insurance settlements is further compounded by their vivid memories of being betrayed by insurers after Hurricane Hugo in 1989 and Hurricane Marilyn in 1995. Some residents are still paying for loans they took out to cover their losses. Their examinations uncovered an alleged scam by Byam Insurance Agency, an insurance agent on St. Croix. As an agent, Byam was supposed to collect insurance premiums from policyholders on behalf of the insurance company it represents and turn the money over to the company, but Potter said Byam kept the money. “Homeowners expected that they had coverage from this insurance company, but the agent pocketed the money,” Potter said. While unnerving, he said residents should not be alarmed. “We were able to get the company to honor the policies under the coverage that the insured paid for.” Potter did not say how he achieved this feat, and he would not identify the name of the insurance company that was swindled, but he said Byam is being investigated by the attorney general’s office. Potter attributed the slow pace of insurance settlements to the “share volume” of claims. “There are a lot more claims this go-round than in the past,” he said, quickly adding, but that is not an excuse for the delay in payments. Residents can rest assured, he said, that insurers doing business in the Virgin Islands are in good financial condition. “We are not concerned about any of the insurance companies going bottoms up. In fact, if anything were to happen, we have an Insurance Guaranty Fund that is set aside for that purpose,” Potter said. However, this may be of little comfort to residents. Although the Insurance Guaranty Fund was created to pay property owners’ outstanding claims if their insurance company becomes insolvent, Potter admitted that the government has withdrawn money from the fund for years to meet payroll obligations and pay for essential public services. In 2012, the Legislature of the Virgin Islands passed the Employment Relation and Economic Recovery Act, which reduced the cap for the insurance fund from $50 million to $10 million and stipulated that any amount over the cap “shall be” deposited into the General Fund, the government’s main operating budget. The reduced cap was slated to expire on Sept. 30, 2015, but the reduction was extended to Sept. 30, 2017 upon the governor’s request. In his Fiscal Year 2018 budget, the governor proposed extending the reduction again to 2019, but Post Auditor Jose George said no legislative action was taken, which means that by law, the cap on the insurance fund reverts to $50 million. Government officials charged with overseeing the insurance fund did not respond to inquiries regarding how much money is currently in the fund. Due to the hurricanes, George said the legislature was unable to enact a new budget, so the government continues to operate under the Fiscal Year 2017 budget. A review of data from the Office of Management and Budget show that in Fiscal Year 2017, $12 million was transferred from the insurance fund to the General Fund, and $15 million was targeted to be transferred for Fiscal Year 2018. After Hurricanes Hugo and Marilyn, money from the insurance fund was used to pay residents’ outstanding claims when their insurance companies went bankrupt, according to a 2007 news release by the government. Some residents did not get their final settlement payments until 2007. Though Hugo and Marilyn were devastating, officials say Hurricanes Irma and Maria were worse. Potter was baffled by the large number of underinsured residents, because his team launched a multifaceted educational campaign shortly after he took office in 2015 to educate residents about homeowner’s insurance and the risk of being underinsured. Yet, many homeowners insist they were not aware that they were underinsured. “In most cases, it’s not ignorance, but it’s a financial consideration,” Potter said. People try to save money by eliminating things from their policy like “contents,” which covers personal and household items. Other factors can cause someone to be underinsured. Generally, insurance companies require policyholders to maintain 80 percent of the replacement value of their property, that is, the actual dollar amount that would be needed to replace damaged property without deducting for depreciation, explained Glendina Matthew, assistant director of the Division of Banking, Insurance and Financial Regulation. People who do not meet this requirement and insure their homes for less than what the insurer says it would take to rebuild their home are putting themselves in the position of being underinsured. On Jan. 23, Potter issued another order directing insurers and their agents to notify policyholders of their underinsurance and tell them what they need to do to maintain full coverage to avoid residents being blindsided in the future. He said homeowners also have a responsibility to make sure they understand their policy. Brady said insurers will also be required to do a “second review” of policyholders who were deemed to be underinsured to make sure their analysis was accurate. For more information or to file a complaint, call the Division of Banking, Insurance and Financial Regulation at 340-774-7166 or 340-773-6459. As of Feb. 9, 2018, the balance of the Insurance Guaranty Fund was $16.5 million, according to Commissioner Valdamier Collens of the Virgin Islands Department of Finance. Collens provided the information in a written response to an inquiry made under the territory’s public information statutes. The letter was signed by acting commissioner Clarina Modeste-Elliott on behalf of Collens. Data provided by the commissioner’s office reveal that over the past five years, from Oct 17, 2012 to Dec. 19, 2017, the government withdrew about $92.5 million from the insurance fund to pay for other government services. Of that, $73.4 million was transferred to the General Fund. “Cognizant of the government’s cash liquidity stress, fiscal management required prioritization to ensure financial obligations are met,” Collens stated. Modeste- Elliott said the government will make another request to the legislature in its Fiscal Year 2019 budget to reduce the Insurance Guaranty Fund’s minimum balance again to $10 million. Despite the catastrophic destruction caused by two Category 5 hurricanes in the U.S. Virgin Islands in September, that tested the resiliency of the financially-strapped government and hurricane-weary residents, Gov. Kenneth Mapp assured residents Monday in his fourth State of the Territory address that the future of the Virgin Islands is bright. Hurricanes Irma and Maria wreaked havoc on the islands’ infrastructure, and its antiquated water and power distribution system, leaving thousands of residents without power and running water for almost four months. Those without generators were forced to fetch cold water from their cisterns to bathe and make do with whatever food they could eat that did not require heating or refrigeration. “I got my power back on Jan. 3,” said St. Thomas resident Quincy Thomas, as he chuckled, noting that he had to acclimate himself to where the light switches were in his home. The governor attributed the territory’s ability to bounce back after two Category 5 storms, that occurred within two weeks of each other, to the faith and resiliency of Virgin Islanders, assistance from the federal government, and help from fellow American citizens who assisted with the recovery process and provided humanitarian aid. This included National Guard troops, law enforcement officers, disaster emergency responders, health care workers, volunteers, road clearing and debris removal crews, and nearly 850 off-island linemen from around the country who assisted the Virgin Islands Water and Power Authority’s crews with the herculean task of repairing the U.S. territory’s electrical grid. Duncan donated not only his time and his money but manned distribution centers on St. Thomas and St. Croix. This month marks Mapp’s fourth year in office. When he became governor on Jan. 5, 2015, Mapp said that the Virgin Islands government was on the “verge of financial collapse,” and he inherited a public pension system that was on “a downward slide to insolvency.” He said he also inherited a declining tax base, unfunded labor agreements, over three years of unpaid income tax refunds, a shrinking labor force of essential public service personnel, a high violent crime rate and a police department with insufficient resources. The territory had also accrued huge debts from years of borrowing to keep the government afloat. When Mapp assumed the office of governor, Soury said the government had $432 million in delinquent property and income taxes. “The director of the Bureau of Internal Revenue launched an aggressive effort and collected $126.3 million in delinquent taxes in the last three years,” Mapp said. As more proof of his administration’s accomplishments, Mapp said that, in 2015, the U.S. Department of Commerce reported that the Virgin Islands’ economy showed signs of growth and that government expenditures were down for the first time in a decade. However, the territory’s bond rating was further downgraded in January 2017, and the financial markets no longer want to lend money to the Virgin Islands, much to the consternation of Mapp and Soury who insist that the territory’s bonds are secure. The massive recovery effort has resulted in a boon in construction jobs which will increase consumer buying power and improve the economy for the foreseeable future, Mapp said. The government also has a great opportunity to improve its tourism industry, which is bouncing back, and rebuild stronger and better. Soury said the bonds are paid from rum tax revenues generated from two rum distilleries, located on St. Croix, which continue to operate and sell their products to the U.S mainland. Rum production is the second main industry after tourism, and it generates a significant amount of revenue, he said. “The rum producers sell their products to the U.S government which charges a tax, and that tax is remitted back to the Virgin Islands government,” Soury explained. “The money is taken out by the U.S. Treasury before the Virgin Islands even gets it, which is why our bonds are secure.” Soury added that the U.S. government receives about $223 million annually from rum taxes, and $85 million of those revenues go toward payment of bonds annually. Going forward, Mapp said the continued viability of the Government Employees Retirement System (GERS) remains one of his top priorities, and he asks senators to work with him to find qualified persons to join the GERS Board of Directors. He said that he has commissioned Capital Markets Advisors LLC to do an analysis of the system and look at similarly situated public pension programs that have achieved greater solvency. “Collapse of the GERS is not and cannot be an option,” he said. However, some senators said the governor has not done enough during his time in office to shore up the system. In addition to the bond debt, the government owes the retirement system $3 billion in unfunded liabilities, Soury said. Several senators said they appreciated the governor’s optimistic outlook, but they expected more details regarding emergency temporary housing. Many residents are still living with family or friends, or in boarded up damaged homes with breached roofs covered with tarpaulins, and they are desperately waiting for insurance settlements or help from federal agencies charged with providing disaster relief. In an interview with WTJX following the governor’s speech, Sen. Marvin Blyden said he has met with several residents who need emergency housing. He said a woman with eight children, who was living in a hotel, recently came to him seeking help, because she had to leave the hotel so it can be repaired. The Department of Housing and Urban Development (HUD) is providing vouchers to eligible hurricane survivors to lease temporary housing for a specific time period, Mapp said. Due to the scarcity of available housing and hotel rooms, there is a long waiting list for this program. “We currently have 2,000 applicants on the waiting list,” Mapp said. “There are several folks with vouchers that came to my office, because they have been told their time is up,” Blyden said. The Federal Emergency Management Agency (FEMA), the Small Business Administration and the Virgin Islands government are also offering assistance to residents whose homes were damaged or destroyed, but senators say these programs do not sufficiently address the immediate housing needs of displaced residents. FEMA officials say the agency does not plan to construct any new temporary housing or ship mobile homes to the territory, because those options are too costly. Instead, FEMA is offering eligible survivors financial assistance, so they can repair their own home and replace damaged items; and rental assistance so displaced hurricane survivors can rent housing. Under its Multi-family Lease and Repair program (MLR), FEMA will lease existing temporary multi-family housing units directly from landlords for eligible survivors. Landlords with multi-unit properties must apply for the program. “Ideally, we would like move-in ready properties,” said Manuel Broussard, an assistant external affairs officer for FEMA. However, Broussard said, FEMA may help landlords with damaged rental units make repairs if the damage was caused by the 2017 hurricanes and repairs can be made quickly so the units can be put back into the islands’ housing inventory. This program may also not be a viable solution for addressing most of the housing needs, because a lot of the rental units in the Virgin Islands, particularly on St. Croix and St. John, are not part of a multi-family development, but rather apartments that are attached to a house. FEMA is also providing “necessary” direct home repairs under its Permanent Housing Construction (PHC) program for eligible survivors who sustained at least $17,000 in verifiable damages, but whose homes were not destroyed by the hurricanes. The program is only intended to make homes “safe, sanitary and functional.” “The PHC program is for people whose homes are so damaged that they are not suitable for living in. This program is rarely used,” Broussard said. “It is being used now because the housing challenge is so large in the Virgin Islands.” It is unclear where residents will live while these repairs are being made if they cannot find available housing. While people with insurance can obtain FEMA assistance, FEMA is a grant program that is designed for the uninsured and underinsured. “It is designed to help people get back on their feet. It is not designed to make people whole,” Broussard said. This is why, he said, survivors are also asked to apply to the Small Business Administration, which offers low-interest loans. FEMA is also providing funding for the Sheltering and Temporary Essential Power Program (STEP), which is administered by the local government. This program allows residents to shelter in place, which means that they will be able to remain in their homes while permanent repairs are made to their homes to make them functional, but this program may not be a viable option either for residents whose homes sustained major damage. Mapp said FEMA has approved an initial budget of $600 million to fund the STEP program, which will provide permanent roofs for approximately 12,000 homes. Homes that did not qualify for FEMA’s Blue Roof program, which placed temporary tarps on roofs, will be given first preference. “To date, FEMA has provided about $58 million [to the territory] in individual assistance including rental assistance, housing repairs, and other needs such as medical and funeral assistance [to help pay for expenses] that are related to the storm,” Broussard said. He added that people who are denied FEMA assistance can appeal the decision. The slow pace of insurance settlements is also a major concern for residents and senators. Although the insurance companies have disbursed $420 million to date, only 4,208 residents have received settlements. This is less than 40 percent of claims, according to the governor. “The Lieutenant Governor has asked me to inform all licensed insurers in the territory that he is not pleased with the level of adjusters retained to review claims or the pace at which the claims are being settled. The insurance companies must do better for their customers. Be assured that regulatory action by the Commissioner of Insurance is on the way,” Mapp said. Some residents, who have lived through this nightmare before, say the government needs to crack down on insurance companies who have a history of failing to expedite insurance claims after a disaster. Sen. Alicia “Chucky” Hansen, who also appeared on WTJX, said she was pleased that the governor raised the insurance issue and that the matter needs to be investigated by the legislature. “People have been paying insurance for 5, 10, 15, 20 years, and then all of a sudden when it’s time to settle their claims, they are told they are underinsured or they have no adjusters or if they send an adjuster, when the adjuster come, they don’t hear again from the insurance company,” Hansen said. Hansen also expressed her disappointment with the treatment of 12 National Guard troops, who worked diligently after the hurricanes to serve the community despite their personal losses, but were not paid. The governor told the Adjutant General of the Virgin Islands National Guard, Brigadier General Deborah Howell, during his address to tell the troops that they will be paid after they submit an I-9 Form – a move Hansen called insulting. The form is used to determine one’s edibility to work in the United States. Several senators also expressed concern about the slow pace of construction of temporary hospitals and public schools, which are still operating with half-day sessions. Both hospitals were virtually destroyed by the hurricane, forcing health officials to medically evacuate 682 individuals off-island, 284 residents, including dialysis patients, remain on the mainland, Mapp said. Although these patients are anxious to return home, it’s too risky due to the lack of adequate medical facilities in the territory. Mapp said the government is awaiting the shipment of equipment to construct a temporary modular hospital on St. Thomas and St. Croix that will include an operating bay, a dialysis unit and a medical clinic, but he did not specify when these units will arrive or explain why it has taken four months for the temporary medical facilities, which were promised months ago, to be established. Both hospitals have continued to provide limited health care services in certain sections of the hospital. Mapp said that he wants to build smaller hospitals to replace the 250-bed hospitals. A couple of senators questioned whether this is a wise decision. Alkin Paul and his family are trying to adjust to a new normal after their lives were turned upside-down in September when Hurricane Irma, a Category 5 storm, ripped through the U.S. Virgin Islands, leaving a trail of destruction in its wake. Paul and his wife have gone back to work, their children are back in school, but at the end of the day, they have to return home to a boarded-up house with an empty living room. All of their furniture, except for their dining room table and beds, were destroyed, Paul said. Fortunately, Paul’s home has power. Irma damaged the islands’ electric grid, but Paul said his power was restored on Dec. 5. Before then, he said he spent a minimum of $300 a month in fuel to run a small generator for four hours a day, and he ate a lot of MREs (meals ready-to-eat). His family did not care for the prepackaged, low-sodium meals. Thousands of residents in the U.S. territory are living like the Pauls in severely damaged homes. Many still do not have electricity and are hoping that the government will achieve its goal of restoring 90 percent of the islands’ power by Christmas. Paul contends that unnecessary red tape by the local government has hindered the power restoration process. Although it has been over three months since Irma hit, Paul said he has not received any assistance yet from his insurance company or the Federal Emergency Management Agency (FEMA) to repair his home. Several residents have had the same complaint. Having lived through two devastating hurricanes in the past, the 34-year-old father of four young children took no chances. He secured his three-bedroom, two-bath apartment, which is perched on a hill in the Contant area of St. Thomas. Sadly, Paul’s handiwork was no match for the brutal force of Irma’s 185 mph winds. Paul said he and his family were sitting in their living room around 10 a.m. on Sept. 6 when Irma struck. The ferocious winds bent his 10-ft. sliding-glass door, shattering half of the glass and blew out his two wooden entrance doors. In the middle the hurricane, Paul said he also ran to his truck several times to get tools to secure the remaining shutters; all the while trying to dodge four of his neighbor’s Rottweilers that were roaming around. “I lived through Hurricane Hugo and Marilyn, but Irma was in a completely different league,” he said, adding that the air pressure from Irma’s howling winds created a painful sensation in their ears. Paul said he was able to make temporary repairs to his home to make it livable, as he is a skilled craftsman and the owner of a construction and project management company called Unparalleled Vision. “I never received a tarpaulin from any of the distribution centers, because they kept running out,” he said. Just when it seemed like the worst was behind them, Hurricane Maria, another Category 5 storm, tore through the U.S. Virgin Islands 12 days later. St. Croix bore the brunt of Maria’s treacherous winds, but the storm caused unprecedented torrential rain, flooding and mudslides on St. Thomas. “The first two weeks after Maria was nothing but consistent rain,” Paul said. So, he had to use containers to catch water from his leaking roof. “When it rains water still comes in,” he said. Paul is not alone. Even though thousands of residents covered their breached roofs with tarps, their homes still leak and flood when it rains. “Some tenants that I know were asked to leave because their landlord needed their apartments to live in,” Paul said. Though Paul thought he was prepared financially for a disaster, he recently discovered that he does not have adequate insurance to cover his losses. According to Lt. Governor Osbert Potter, a lot of Virgin Islanders are underinsured. Paul said two insurance adjusters inspected his home, and the last adjuster deducted 33 percent off his estimated damages. Even though some banks gave residents a three-month moratorium on paying their mortgage without a penalty, Paul said, it will be difficult for people to pay three months of back mortgage at one time if they have not received any money to repair or rebuild their home, because they will need that money. Paul is also still trying to get help for his parents who live in Smith Bay. Their house was not damaged, but Paul said his parents do not have power, and they are living in hazardous conditions. The road to his parents’ home and eight other homes is too damaged for the linemen from the Water and Power Authority to travel on, he said, so they had to bypass their road when they came to restore power. Paul said local government officials have refused to fix the road, because they say it is a private road. He is waiting to see if FEMA can help. Most residents in the Virgin Islands get their water supply from individual cisterns which have their own septic system that stores sewage and disposes it underground. Due to the buildup of water pressure from the hurricanes, water is seeping under the road, and the backed-up sewage is coming out in the road, because the sewage tanks are full, said Paul, who is also a marine biologist. He said he has spent $2,500 to make minor repairs to the road, but it will cost a lot more to repair the damage. Paul said the road and sewage problems have also affected his parents, especially his father who has a heart condition. “My parents have to park two houses away and walk through the neighbor’s backyard to get to their house,” he said. “Two weeks ago, my dad had to go to the hospital, and he spent three days there, because it was too much for his heart walking two laps through a muddy backyard. The doctor said there was too much stress on his heart.” His father was later transported to Puerto Rico for a heart procedure, but he is back home. The disaster has brought out the best and worst in people, Paul said. “Some businesses gave away 45 generators for free,” he said, whereas others engaged in price gouging. “On Nov 22, two stores were selling a gallon bottle of Clorox for $9.99. The average cost of Clorox on island was $2.90 before the storm,” he said. Clorox is widely used to cleanup mold. Photo was posted on Facebook by Joanne Shumate White who lives in the U.S. Virgin Islands. It has been three months since the U.S. Virgin Islands was struck by two Category 5 hurricanes that severely damaged the islands’ infrastructure, crippled its tourism industry which is the lifeblood of the economy and turned residents’ lives upside-down. Though the trees and shrubbery that turned brown after being desolated by the hurricanes have returned to their natural green color and there are other signs of normality, thousands of Virgin Islanders are still living without basic necessities like running water, power and a decent place to live. “I know that there are people living in their cars,” U.S. Virgin Islands Gov. Kenneth Mapp said recently. The U.S. territory includes four islands and has an estimated population of 104,000. Hurricane Irma devastated the district of St. Thomas and St. John, which includes Water Island, when it ravaged the islands on Sept. 6 with 185 mph winds. Before residents could come to terms with the devastation, Hurricane Maria ripped through the Virgin Islands about two weeks later with 176 mph winds, leaving behind more shell-shocked residents and causing more catastrophic damages. St. Croix was largely spared by Irma, but it bore the brunt of Hurricane Maria’s ferocious winds. Although the St. Thomas – St. John District did not get any hurricane-force winds from Maria, the storm caused torrential rain and an ocean surge of 6 to 9 ft., resulting in massive flooding in Charlotte Amalie, the capital of the U.S. Virgin Islands, and unprecedented mudslides throughout the islands’ mountainous terrains. Residents who have lived through major hurricanes in the past say Hurricanes Irma and Maria are the worst they have ever experienced. Thousands of residents are living in severely damaged homes, overrun with mold, and have to endure frequent flooding and leaks from excessive rainfall. “People are living in a room or two in their homes, and when it rains they go in their cars, because their car is dry, and their house is still leaking,” said Vivian St. Juste, a St. Thomas resident whose home was decimated. Due to the massive destruction, there is a scarcity of housing, and most hotels are closed for restoration. Most residents whose homes were destroyed have sought refuge with relatives or friends. Mapp said he is amazed that the hurricanes did not kill a lot of people. The official death count is five, but one may never know how many people may have perished from stress or the inability to obtain adequate medical care. The hurricanes also severely damaged the territory’s water and power distribution system, the airports, government buildings, several fire and police stations, the telephone and cable system, and educational and medical facilities. Nine schools were destroyed. The islands’ two hospitals were also virtually destroyed, forcing the continuous evacuation of patients with serious medical conditions to hospitals in Puerto Rico and the mainland. Despite the damages, certain sections of the hospitals are open, and they are providing limited medical services. Communication in and out of the islands is sporadic. Although the roads are cleared, residents say the debris from toppled trees, electrical poles, wires, fragments of rooftops, damaged furniture, mattresses and other household items are lying on the roadsides. And, driving around is risky, especially at night, because there are gaping holes in the roads and most street lights and traffic signals are down. Mapp said the damages to the roads exceed $40 million. On Dec. 1, local senators, concerned about the health and environmental effects of burning debris, passed a bill banning the burning of fallen trees and other vegetative debris generated from the hurricanes. Nevertheless, Mapp said he will incinerate 35 percent of the debris, and the rest will be mulched and composted. Mapp contends that burning is the fastest, most cost-effective debris disposal method, because the federal government will only pay for debris cleanup and disposal until March 2018. The debris will be burned in a pollution-controlled device to reduce emissions, and the Environmental Protection Agency will monitor the burning to minimize air pollution, he said. “The governor has 10 days, excluding Sunday, to sign bills into law. If the governor already issued an order to burn, he is not violating the law,” explained Quincy Thomas, researcher for the Legislature of the Virgin Islands’ Senate President Myron Jackson. Sen. Jackson said he is disappointed by the governor’s dismissal of the legislature’s action, and he will call for an override of the bill after the governor vetoes it. If necessary, he will file a lawsuit. “Our community is already burdened with the challenges of health disparities,” said the St. Thomas senator, who takes care of his 89-year-old mother and has been without power since Hurricane Irma. Irma destroyed 90 percent of the power transmission and distribution system in the St. Thomas – St. John District, said Julio Rhymer Sr., the executive director of the Virgin Islands Water and Power Authority (WAPA). This caused a district-wide blackout. Rhymer added that Maria destroyed 65 percent of the transmission and distribution system on St. Croix. This was a big blow to WAPA’s antiquated power system. For decades, residents have been subjected to regular power outages and very high utility bills. The governor said Monday that power has been restored to 55 percent of the territory. This amounts to 27,300 of the approximately 44,000 customers on St. Thomas, St. John and St. Croix, he said. All the customers on Water Island, except for two, have been energized. However, Mapp did not say how many residential households on the other islands actually have power now. WAPA is still aiming to get 90 percent of the territory’s power restored by Christmas and 100 percent of customers, whose homes have been deemed safe to reconnect, restored by January. Most residents get their water from cisterns which require electricity to pump water through their pipes. So, those without electricity are using a bucket to draw water from their cisterns to bathe and wash dishes. Some people have generators which cost $20 to $70 a day to operate because of the price of fuel, said Thomas, who resides on the Northside of St. Thomas. He does not have power yet either. “It’s costing me $20 a day to run my generator for six hours,” he said. Only about 12,000 residents are connected to the potable water distribution system which is completely restored, Rhymer said. The Federal Emergency Management Agency (FEMA) finally rolled out the disaster food stamp program in November. FEMA reported that more than 27,500 households received debit cards to purchase a two-month supply of food, but with no electricity, most residents cannot refrigerate or heat food. Over 800 linemen from the mainland are working with local crews to restore power. Aside from significant damages to the electrical grid, Rhymer said other factors have prolonged the restoration process. Unlike other jurisdictions, WAPA has two separate distribution systems, one in St. Thomas and one in St. Croix, and there have been logistical challenges. The equipment and supplies they need must be shipped, so WAPA had to wait for the airports and seaports to be cleared for use, Rhymer explained. According to the Virgin Islands Territorial Emergency Management Agency (VITEMA), more than 10,000 electrical poles, hundreds of trucks and thousands of miles of electrical wire were shipped to the territory. Rhymer said transformers, arms for street lights, traffic signals and other equipment also had to be shipped. Additionally, he said WAPA has to compete with local merchants and others for space on cargo ships, and with other disaster areas in the Caribbean and the states for materials. Rhymer also had to figure out how he would house and feed people who were coming to help. The off-island linemen working on St. Thomas and St. Croix are staying in two cruise ships, and those on St. John are staying in a couple of functioning hotels, Rhymer said. WAPA also cannot have crews working in the dark. FEMA has allocated $109.5 million in public assistance grants for power restoration, debris removal and other emergency protective measures, said Donald Caetano, external affairs director for FEMA’s Region II. Out of those funds, $80 million was designated to WAPA for power restoration, Rhymer said. However, he said WAPA needs an estimated $850 million to rebuild the system and make it more resilient, energy efficient and cost-effective. Congress also approved $4.9 billion in community disaster loans for the U.S. Virgin Islands and Puerto Rico to cover operational expenses, $800 million of that money was earmarked for the Virgin Islands, Thomas said. After hearing dismal reports on Dec. 1, on the government’s financial condition and that of its hospitals, university and Waste Management Authority, the Virgin Islands Legislature reluctantly approved a request by the governor to borrow as much of the $800 million as necessary to sustain the financially strapped government. “Our current estimate of lost tax and other revenues to the government is $1.5 billion over the next three years,” said the Commissioner of the Department of Finance Valdamier Collens in his appeal before the legislature on behalf of the governor. Mapp has also appealed to Congress for an increase in the territory’s allotment. He said the government needs at least $7.5 billion to rebuild more resilient hospitals, schools, and roads, and to provide WAPA with the $850 million it needs to build a more modern, hurricane-resistant system. “The U.S. government is on its fifth rebuild of the power distribution system in the U.S. Virgin Islands,” Mapp said, adding that an investment in mitigation measures is necessary to reduce future damages and costs from hurricanes which is an inescapable part of life in the islands. Mapp plans to build stronger hospitals with a capacity of about 125 beds, rather than another 250-bed hospital. He also plans to rebuild six of the nine schools that were destroyed. Rhymer said WAPA had already secured a bond to modernize the power system before the hurricanes. Solar panels with electronic devices were being installed on street light poles to provide power to residents. This system allows WAPA to measure residents’ consumption remotely instead of physically going to customers’ homes to read meters. Twenty percent of the solar panels were installed before the hurricanes, but they were damaged. When interviewed on Dec. 1, Rhymer laid out his plans for future improvements to the electrical grid, but the governor announced Monday that he has nominated Rhymer to be the new director of the Office of Management and Budget, a position better suited for his financial background. Rhymer will leave WAPA on Dec. 31, and the agency’s operating officer, Clinton Hedrington Jr., will serve as WAPA’s acting executive director. Rhymer plans included expanding the agency’s renewable energy system to use more solar, wind and/or microgrids. A microgrid is an independent system that will allow WAPA to provide power separately to certain customers, so if the main grid is damaged, those customers would not be affected. Renewable energy will reduce the agency’s dependency on fuel and result in cheaper utility bills, he said. Rhymer also planned to construct more underground cables in critical areas to protect the system from inclement weather. Less than 10 percent of the system is currently underground, he said. Burying all cables underground is not feasible, Rhymer added, because it would cost $6 billion. It’s uncertain at this point how much of Rhymer’s plans will be implemented. The governor’s request for more funding has come under scrutiny, as some members of Congress have expressed concern about the government’s ability to manage its finances. Like Puerto Rico, the Virgin Islands was in the midst of a fiscal crisis before the disaster and in deep debt from years of borrowing to keep the government afloat. Collens attributed the government’s financial woes to the lingering effects of the global financial crisis of 2008, the closure of a major oil refinery on St. Croix in 2012, rising pension costs and the cost of government services, and declining revenues. The U.S. Virgin Islands has also had its share of government corruption. However, Virgin Islands’ Delegate to Congress Stacey Plaskett insists that the territory’s financial problems are rooted in the disparity in the allocation of federal funds which compels the government to borrow money to maintain and improve its infrastructure. States are given a greater percentage of federal funds than the territories for their infrastructure, schools, hospitals, roads, and Medicare and Medicaid programs, Plaskett said in a news conference in Washington. Plaskett has been vocal about her dissatisfaction with the Trump administration’s response to the disaster. Mapp, on the contrary, has praised the administration’s response, but he expressed frustration with the slow pace of debris removal and the slow start of FEMA’s Operation Blue Roof program, which covers breached roofs with a fiber-reinforced blue plastic sheeting until permanent repairs can be made. Over 3,600 “blue roofs” were installed; 1,636 residents who applied for the program did not qualify, said George Stringham, spokesman for the Army Corps of Engineers. “If the roof is too damaged or unsafe to install it was not eligible,” Stringham said. Some residents may not have applied, because of the requirements, Stringham conceded. Due to the cost of constructing temporary housing and shipping mobile homes, Caetano said FEMA will not provide temporary housing facilities. Instead, FEMA will temporarily lease “move-in ready” rental units from property owners for eligible survivors. Given the shortage of undamaged housing, this program may not be a viable option for many people. Most residents will have to shelter-in-place while temporary or permanent repairs are made to their homes that are “necessary to restore the pre-disaster residence to a safe and habitable condition,” Caetano said. “FEMA’s role is not to make people whole. We just get them back on their feet.” Some residents were placed in congregant shelters, he said. Mapp told FEMA Administrator William “Brock” Long when he visited the territory on Dec. 5 that homeowners and renters need more options for temporary housing and assistance in repairing homes. “Many Virgin Islanders live in rental units or family-owned apartments, rendering the occupants ineligible for some forms of assistance, and FEMA needs to adopt some of its policies to better assist both renters and landlords,” the governor said in a news release. While life in the Virgin Islands is far from normal, some of the beaches have re-opened; government operations have resumed; some people have gone back to work; several banks and grocery stores have reopened though there are complaints of price gouging; airline service and cruise ship calls have resumed on a limited basis; and public schools have reopened with half-day sessions. However, it will take years for the Virgin Islands, once dubbed “America’s Paradise,” to fully recover, and distressed residents, who have already suffered so much, are trying to brace themselves for the long road ahead. “It will take a century or more for the restoration of our environment,” said Jackson, as he lamented over the loss of the territory’s historic, landmark trees and cultural landscape.